Disruptive Innovator: Oreos + Marshmallows! Yup, it's as gross as it looks! Take a handful of marshmallows and a tablespoon of butter and microwave for about 20 seconds or until the Marshmallows grow too big (best to watch while it cooks). 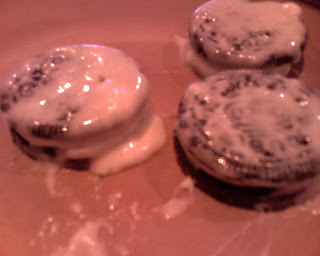 Mix, then dip in the Oreos and let them cool off in the fridge. Eat until you get sick (that's two Oreos for me). Depending on how much butter is in the mixture the coating will be anywhere from soft and chewey taffey texture to hard toffee candy-like. Good luck with the dishes!